It seems that inefficiency isn’t always a bad thing. Recent research shows that dynein, a motor protein, has a “strut” like motion instead of the usual structured motion seen in other molecular motors. This seemingly random motion of stepping sideways, backwards, and forwards may even allow dynein to avoid cellular obstacles, which may help keep cells alive and healthy. Monty Python may claim credit for immortalizing the “silly walk,” but molecular biology beat the comedy troupe to the punch. It turns out that a tiny motor inside of us called dynein, one tasked with shuttling vital payloads throughout the cell’s intricate highway infrastructure, staggers like a drunken sailor, quite contrary to the regular, efficient poise of its fellow motors. But researchers led by Samara Reck-Peterson, HMS assistant professor of cell biology, believe dynein’s theatrical strut and apparent inefficiency may help keep cells alive and healthy. These findings appear online January 8 in Nature Structural & Molecular Biology. Molecular motors, built from proteins, are a kind of transport service that keep cells functioning. They traffic essential chemical packages between the heart of the cell, the nucleus, and the cell periphery. In elongated cells such as neurons, this can be a big commute in cellular miles, equivalent to a person walking from Boston to Manhattan. The constant shuttling of materials by motors keeps cells alive, allows cells to move and divide, and talk to their neighbors. It’s no surprise, then, that when these motors stop functioning, serious problems can result. In fact, defects in dynein-based transport have been linked to Lou Gehrig’s and Parkinson’s disease and the neurodevelopmental disease lissencephaly. To understand how molecular motors work, some researchers are creating animations. Here, each “leg” of a molecular motor called dynein moves as it progresses along a cellular structure called a microtubule. 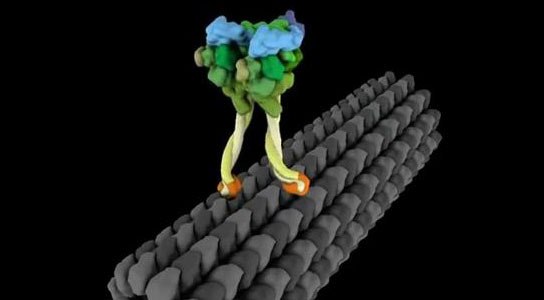 New data suggest that dynein’s walk is even stranger than the one modeled. Animation by Janet Iwasa. To understand how this essential protein machine works, Reck-Peterson and colleagues decided to study the dynamics of motor movement on the nanoscale by developing protein engineering methods and then implementing single molecule imaging technologies. First, they purified dynein motors, whose “legs” were tagged with fluorescent markers, and microtubules, long filaments that serve as dynein’s highway. Next, they put these components on a microscope slide and directly visualized dynein motors stepping along microtubule tracks. Dynein can step sideways, forward, backward, take big and little steps. This is in real contrast to other motors. It may even be able to step around any number of cellular obstacles. In these animations, made by Janet Iwasa, the microtubule highways are in gray and each fluorescently labeled “leg” of dynein (top panel) is represented by a red or blue dot. In contrast to dynein, other motors, such as kinesin (lower panel), step much more regularly. Be the first to comment on "Molecular Motor Dynein Exhibits Strut Like Movement"